The best time to install a tankless water heater is around the time your conventional tank water needs replacing. When you notice water heaters no longer heating or is clogging your water pipes with debris in Roseville, you would be better off switching to tankless water heaters. Conventional hot water tanks are quickly being replaced by modern-day advanced water heaters that are now available such as tankless water heaters. A tankless water heater is very innovative as it allows Roseville consumers to easily access hot water as much as they want at any time they need it. New Flow Plumbing Roseville clients are very happy with the cost and space savings they get from tankless water heaters and it’s high time you should get a tankless water heater installed as well. 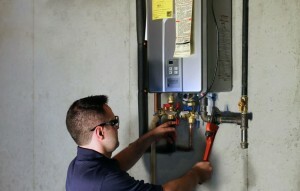 In order to get the most of a tankless water heater, you need to hire a Roseville professional to install it. Plumbers in Roseville would either charge an hourly fee or a flat fee for installation of tankless water heaters and the overall installation cost actually varies on what type of tankless water heater is being installed. That is why as a consumer, you will need to have a good understanding of the different kinds of tankless water heaters. At New Flow Plumbing Roseville, we recommend choosing a type of tankless water heater that is best suited to your needs. Most households in Roseville that are average in size would benefit from a gas tankless hot water heater of 199,000 BTUs that would be adequate for several bathrooms. You also need to consider installing proper ventilation so you can avoid carbon monoxide poisoning as well as changing the gas lines sizes and fittings entirely and this process usually takes an average of 10 hours to finish. On the other hand, if you do not require as much hot water for use, then there are many other tankless water heater alternative models on the market which would be quicker to install by a Roseville plumber. Note that there are electric tankless water heaters like point-of-use mini-tank water heaters which a knowledgeable Roseville plumber can easily install under the sink. The way water is heated for this particular model requires an electrical timer, an electrical outlet, and water supply lines. Nevertheless, it will only take an average of two hours to install this type of tankless water heater, thus, the cost for installation is much lower compared to other complicated tankless water heaters. Part of the installation of a tankless water heater also involves considering the materials included such as a tankless gas connector kit, termination vent kit, a 2-piece lead-free brass tankless water heater valve set, as well as the fittings and mounting hardware. When you consider getting a tankless water heater in Roseville, do take note of the Energy Star rating. The Energy Star ratings will tell you how energy-efficient a tankless water heater is by government standards. You can also find out how these appliances are rated for performance, quality and features via the Energy Star symbols. So what is the difference between a gas and electric tankless water heater? A gas tankless water heater can come in various models and sizes. When water is heated by a tankless gas water heater, the range in output can be from 140,000 BTUs to 380,000 BTUs. There are residential and commercial grades available for these tankless water heaters in Roseville. Contrariwise, an electric tankless water heater is more affordable than gas models. The installation for this type of tankless water heater is also not as complex since there is no need for vents. The biggest pros for this type would be that they are easy to maintain, they perform very well, and they produce high energy ratings. Water is heated extremely fast with tankless hot water heaters. So whatever type you choose, make sure to get a licensed, professional plumber in Roseville who is an expert at installing and repairing tankless water heaters. Speak to a specialist at New Flow Plumbing Roseville by calling 916-527-8885 today!